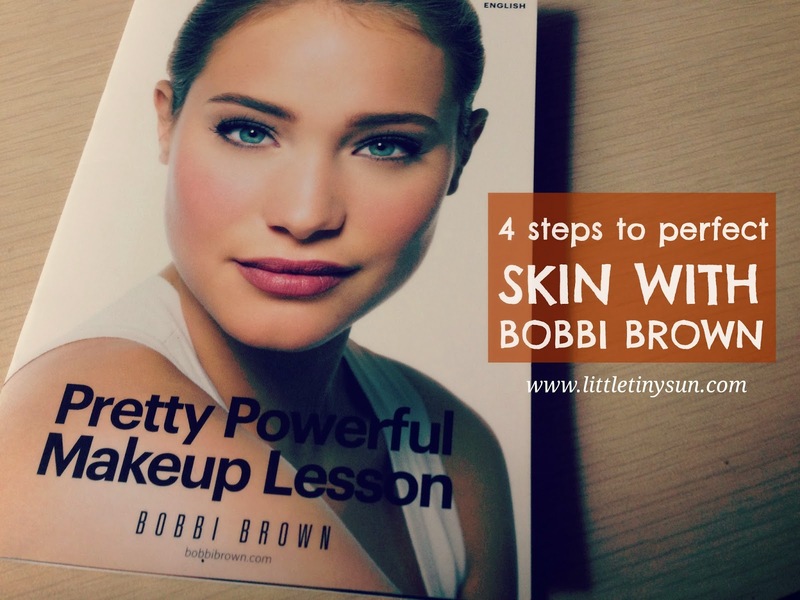 I recently had the opportunity to try the personalised version of the Pretty Powerful Makeup Lesson by Bobbi Brown. According to my makeup artist, the 10-step guide is the secret to a natural-looking face. Unfortunately, due to time constraints, I was able to complete only the first four steps! Indeed, lots of time and effort is needed to achieve perfect-looking skin. This post is a step-by-step guide to a perfect-looking face (without eye and lip makeup). Within each step itself, there are several pointers to note. My makeup artist, Edward, made it a point to remove all the skincare lotion I had on my face before applying Bobbi Brown products. First, he cleansed my face with Bobbi Brown Soothing Cleansing Oil and Advanced Foaming Cleanser. He then used the Extra Bright Advanced Moisture Lotion as a toner, and prepped my face with the Bobbi Brown Extra Bright Serum. He also mentioned it's important to hydrate the skin with Hydrating Gel Cream in Singapore, and pointed out that it is best to use SPF 50 Protective Face Base and Lip Balm (SPF 15) with hydrating eye cream. Edward was really helpful in addressing my skin concerns, especially as I have uneven skin tones. He first used the Bobbi Brown Corrector (light to medium peach), followed by a concealer (natural /pale yellow). I loved the concealer brush and eye blender brush that he used; they were really soft to the skin and the application was really quick. To look natural, it's important to use Bobbi Brown's Skin Foundation (SPF 15) in natural colour. He applied this using his fingertips so that it looks more evenly applied and natural. Edward's knowledge of Bobbi Brown products amazed me. He said Bobbi doesn't believe a bronzer should be used to contour a face, but should actually bring out a person's features and work with the foundation. I'm not really familiar with all this make-up vocabulary, but he applied the Sheer Finish Loose Powder (soft sand) with a powder brush, and a golden light bronzer with a bronzer brush. Edward was really patient in explaining each step, and I guess that's why it took 1.5 hours just to complete the first four steps! Without any eye or lip makeup, I think I look really natural here. Thanks Edward for the insightful lesson! If you'd like to learn more about Bobbi Brown products, you may make an appointment with Edward Chin at Bobbi Brown JEM at 6694 0365.